Desafiando a Nomenklatura Científica: Nosso cérebro é como 100 bilhões de minicomputadores todos funcionando sincronizados: mero acaso, fortuita necessidade ou design inteligente??? Nosso cérebro é como 100 bilhões de minicomputadores todos funcionando sincronizados: mero acaso, fortuita necessidade ou design inteligente??? 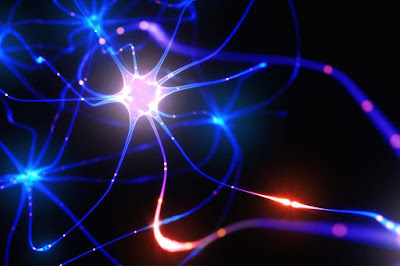 The biophysical features of neurons shape information processing in the brain. Cortical neurons are larger in humans than in other species, but it is unclear how their size affects synaptic integration. Here, we perform direct electrical recordings from human dendrites and report enhanced electrical compartmentalization in layer 5 pyramidal neurons. Compared to rat dendrites, distal human dendrites provide limited excitation to the soma, even in the presence of dendritic spikes. Human somas also exhibit less bursting due to reduced recruitment of dendritic electrogenesis. Finally, we find that decreased ion channel densities result in higher input resistance and underlie the lower coupling of human dendrites. We conclude that the increased length of human neurons alters their input-output properties, which will impact cortical computation.